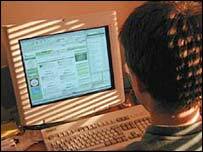 Children would like internet chatrooms closed down to protect them from potential abusers, a report says. The Commission for Social Care Inspection asked 110 10 to 18-year-olds about their concerns and safety fears. It found their main worries were drugs, abduction, bullying but cases such as the Soham murders caused anxiety. The study, which carried out by discussing the issues with the youngsters in 25 consultation groups, found the Soham murder case was fresh in many children's minds. Report author Dr Roger Morgan, the CSCI children's rights director for England, said the phrase "like Holly and Jessica" cropped up time and time again in discussions with the groups. He found many children saw the internet as a risk, after reports of it being used by paedophiles to "groom" their victims. Most were "very aware and wary" of the dangers that could come from entering chatrooms and would be happy for them to be closed. He said many thought internet risks were greater for younger children, who might be more likely to come across something or someone dangerous by accident and less likely to spot risks and block unwanted contacts. Most said they thought schools did a good job of protecting them against such risks but were still concerned. The groups called for all internet chatrooms to be closed down in the interests of safety, the report said. In the document, entitled Safe From Harm, Dr Morgan said the fear of being kidnapped or abducted was also very common. He said: "Young people were clear that although the risk of abduction was low for many children, the possibility of it happening was a high-level worry for them. "They felt you could worry a lot about something serious, even if it was not very likely to happen." One of the most important issues to children was making sure that police checks were carried out properly on adults who worked with or around them. One of the youngsters questioned said: "The Soham murderer would've got a job in our place too." The children suggested extra visits by social services staff to children's homes and other places where children were cared for and called for greater security in and around places were young people went. To tackle bullying, they said they wanted all bullies expelled from schools. Dr Morgan said: "As is always the case with these consultations, I found what children said both thoughtful and worrying. "Worrying, because although children appreciate what is done to protect them, there is so much more that we need to do, and keep doing." The Commission for Social Care Inspectorate is an independent body set up under the Health and Social Care (Community Health and Standards) Act 2003 to oversee social care in England.